Are yard is home to our dog Bear. As with any other family member in our house, he also has friends over that share the yard with him. Setting up our yard to be dog friendly is a must. Can you have a beautiful garden and have a dog? Absolutely. Here are a couple of tips that have worked in our own garden. Design and set up your yard to be dog friendly. How do you do that? One way is to set up their favourite routes as pathways. Use nice soft material such as mulch that is comfortable for their paws and allow them the pleasure of continuing to use their favourite trails. If you are planting garden beds along the fence line, leave a gap between your fence and the garden to allow dogs who like to run along side the fence room to do so. As an added bonus it will give you space to work if you ever need to do any fence repair. Trust me you will be glad that you did. 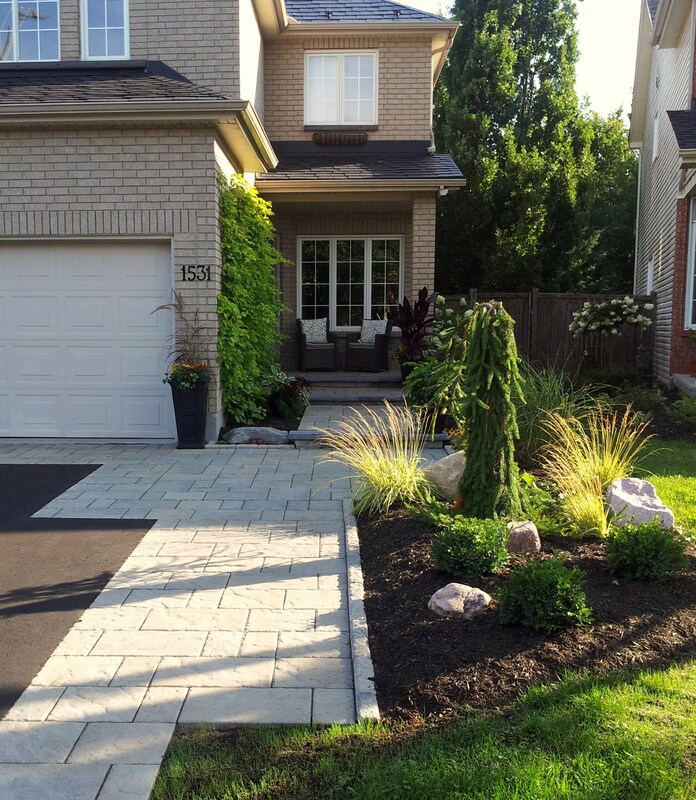 We have the pleasure of installing beautiful gardens around the Ottawa area. One of the recommendations I always give my clients is to remember to include winter interest. We usually achieve this by adding ornamental grasses and conifers to the landscape. 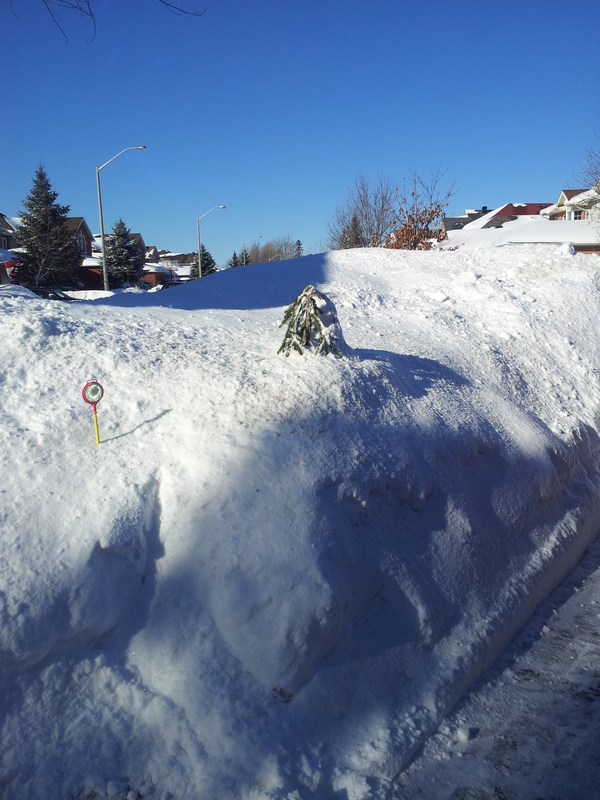 This year our snow load has been huge so our winter gardens are buried. 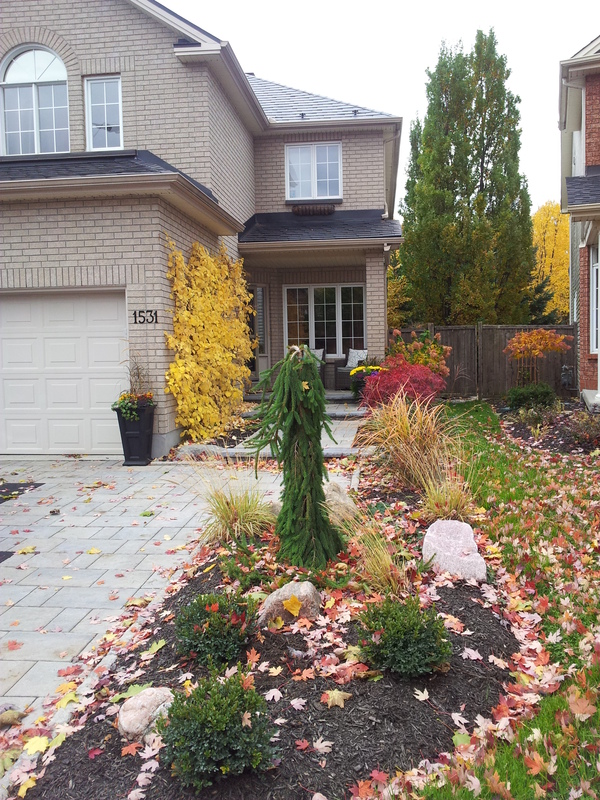 I thought I would share an example of a changing Ottawa garden from summer to winter. As you can see from the winter picture, the garden is almost completely buried. Mother nature is laughing at my winter interest plan. (picture not taken at the same angle. Unfortunately the snow pile is too large from that direction). You can see the top of the Weeping Norway spruce. I had the pleasure of attending Landscape Ontario’s designer conference. It was a fantastic experience. One of the speakers was Paul Zammit from the Toronto Botanical gardens. I found his energy and passion for what he does very inspiring. Paul spoke about the emotion he felt in the garden and his excitement was visible. I felt like standing up and yelling out “Yes, yes, I get it, I feel the same way!”. It is so great to have that opportunity to re-ignite the passion in the cold winter months. Great job Paul and I look forward to hearing you speak again in February. Maybe this time I will jump up and voice my excitement as well. Recently we had some work done on the outside of our home. In the process a large branch was broken off our saucer magnolia. 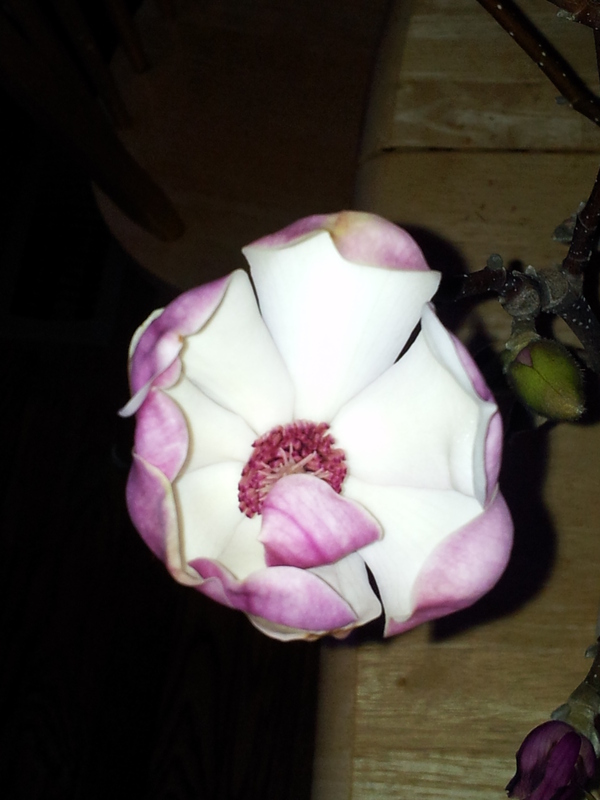 As an experiment I brought the magnolia branch inside and cut the branch into two groups of stems. One half I put into water and placed in a sunny window. The other half was put into dirt in a shady window of the home. Much to my delight the magnolia placed in the sunny window started to flower about a week later. No action on the other half of the magnolia yet but I will keep ya posted. The winter battle has begun. The epic winter battle of rabbits versus Candace have begun. The little rabbit devils have set up residence under the deck in the backyard. Normally I don’t have an issue with added wild life in the backyard but that all changes when they start munching on my trees. The temperature is cold here in Ottawa and standing outside wrapping trees in burlap during a snow storm is NOT my idea of a good time. I was a little slow on the wrapping and they have already done significant damage to my favourite Japanese maple. Ugghhh! Solutions to the destruction? I have not found any yet. The best course of action seems to be to wrap everything of value that remains above ground. My mind has started the thought that now might be the time to adopt a HUNGRY dog. 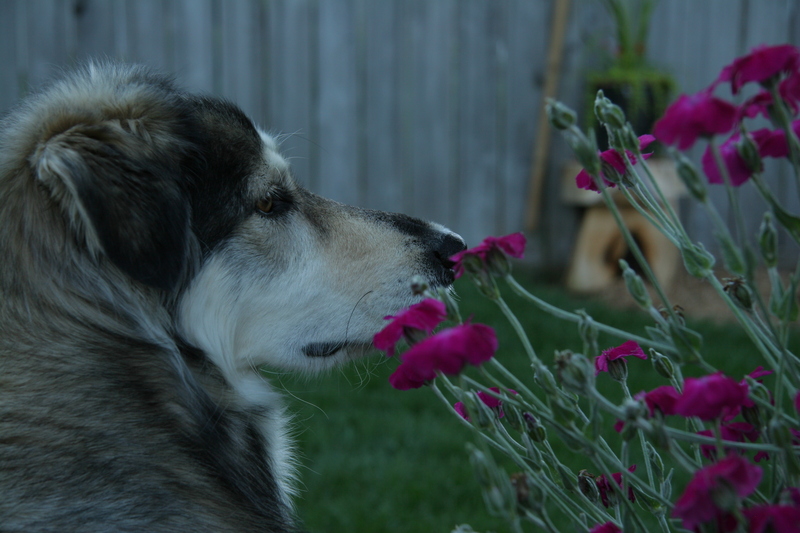 Our current four-legged beast (dog) is very gentle and kind. In fact I would not be surprised if he did not invite them into the yard for company. I am now keeping a close eye on the backyard and the rabbit tracks. We will see in spring what the final score is. Our current dog on duty. A big thanks to all our blog readers for your continued support. We wish you all a very Happy New year ! How to make your own outdoor holiday planter. I thought it would be fun to share in pictures how we create our holiday planters. This is a fun project to do at home and a great way to be creative. I use the tried and true planter method of “thrill, fill and spill”. 1. Floral foam is my best friend this time of year. I leave 3/4 of the dirt in the outdoor planter and fill the top 1/4 with wet floral foam. I then decide on what I would like to use to create the “thrill” in my planters. In this case I used birch poles. 2. In this planter I used Western BC cedar inserted into the floral foam and I worked my way around the edge of the planter. The plan is to have the greens looking like they are spilling over the side of the planter (spill). 3. I add another evergreen with a slightly different colour and texture for contrast. In this case I added ‘Blue tip’ juniper to the BC cedar. Red dogwood branches have also been added for a shot of colour (fill). 4. Keep changing it up. Varity is the spice in a good planter… In this picture I have added some ‘Fraser fir’ to the mix (fill). 5. Time to add some height with greens. 6. I like to add different textures to the center. In this planter I used Magnolia leaves and Euonymus. As an eye catcher I have used a large pine cone (fill). 7. Bling. Depending on how you feel about sparkle, this would be the time to add it. I used large silver sparkly wicker balls for that festive holiday feel (thrill). Every planter I create is different. Putting different combinations together is tons of fun. 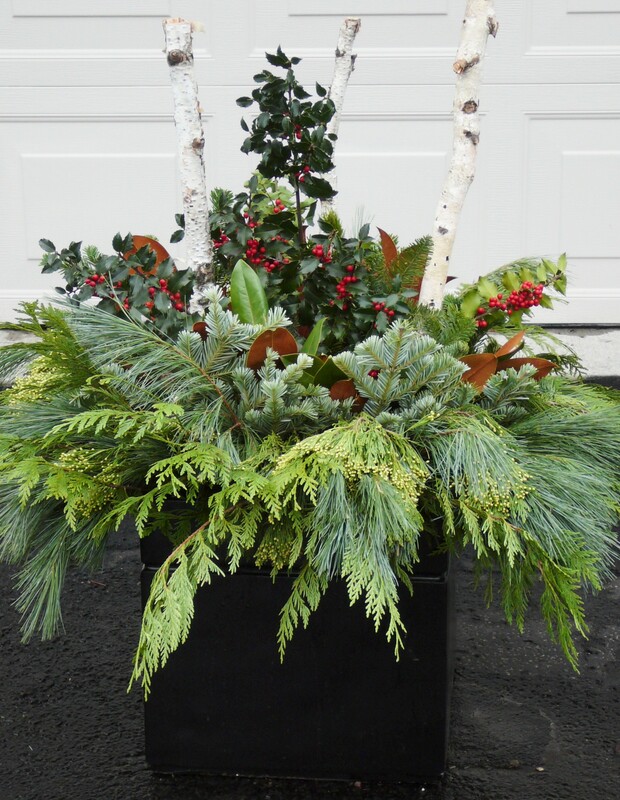 Some other ideas of items to add to your planters are Ilex berries, holly, curly willow branches, birch logs and holiday ornaments. Have fun being creative! One of my absolute favourite ornamental grasses is Miscanthus ‘Huron Sunrise’. It looks fabulous in the summer displaying bright green leaves with a silver center. In mid August burgundy tips appear. In the winter you are left with a tall strong grass that adds much needed winter interest to the Ottawa garden. August picture of ‘Huron Sunrise’. Here is a shot of the grass in winter that gives you a good idea of its height and strength (November 2012). Are your hands freezing yet? When your hands are freezing and you are cursing because you are outside wrapping your trees, that is when it the correct time to protect your plants for winter. I have been driving by homes in our neighbourhood that have had their plants wrapped since October; in my opinion that is WAY too early. When the temperatures rise frequently over freezing and the sun is still heating up the air, it is too soon. Most plants do not need to be wrapped. The reason for the extra protection is for plants that are zone 5 or higher. We do suggest wrapping plants that may have issues with wind burn and the needles drying out. Please feel free to contact us if you have a specific question about winter protection. We are happy to help. The temperature in Ottawa is starting to get cold and as a result the soil in our existing planters is starting to freeze. In the next week or so we will be removing the fall arrangements from the containers and leaving about 3/4 of the soil in the planters. The challenge is always to remove the fall arrangements before they are frozen in place but not too soon for winter arranging. Usually the ideal time is mid to late November here in Ottawa. Think of your cut evergreen boughs like a fresh Christmas tree, they needs to have a good supply of water. One of the tricks we use to achieve this in our outdoor planters is to fill the top quarter of the planter with floral foam. The foam is soaked and holds the water, providing a good moist supply. The fresh boughs and branches are poked into the floral foam and they stay good and damp till freeze up. We also find that the floral foam provides stability for the boughs once the wind and snow starts blowing; it helps to act as an anchor. By using fresh boughs, colourful berries, unusual branches and magnolia leaves, we are able to create winter planters that look good from November till April.